This remote controlled tank robot is a miniature model of a real tank. It has tracked-wheel and it can move in all-terrain environment. 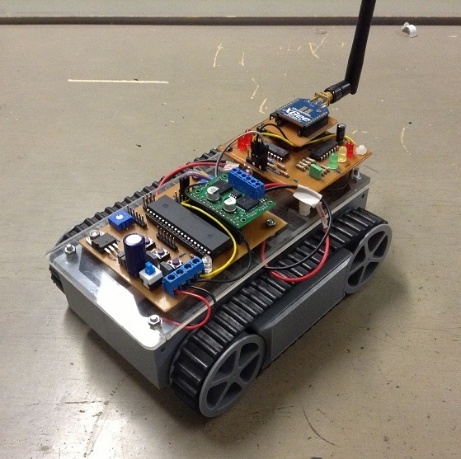 This robot is design to be controlled wirelessly through a remote controller. We use two ZigBee as the wireless communication devices, one attached to the robot and the other to the remote controller. Those devices can communicate up to 100 m for indoor environment and up to 1.6 km for outdoor use. The robot itself is powered by 6 rechargeable AA batteries and can last up to 2 hours of continuos use. An AVR ATMega32 microcontroller is used as robot’s main processing unit. As for the remote controller, we use a Lithium Polymer battery as the main power which is small and lightweight enough for the purpose. 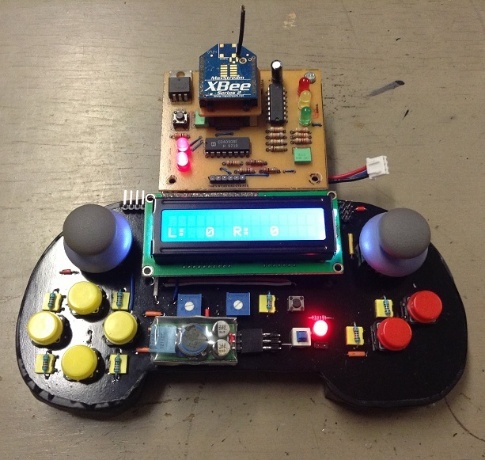 The movement of the robot is controlled by moving the analog stick of the remote controller. As the analog stick being moved, the speed of the robot is displayed onto the LCD of the remote controller. This is a prototype robot for educational purpose, means that it still can be modified for many specific purposes, such as surveillance robot, a wireless controlled carrier robot, or performing household tasks, like gardening or vacuuming.